Susan B. Anthony Spoke Here! When the lights went down at the Martinez Veterans Hall on Monday, March 19, for the first night of the Suffrage Film Fest and the DVD of "One Woman, One Vote" began to spin, everyone in the audience had heard of Susan B. Anthony and had some familiarity with her story as one of founders and for over 50 years one of the most dynamic leaders of the woman's suffrage movement. What most of the audience did not know was that Susan B. Anthony gave a well received 90 minute speech on October 3, 1896 at the Martinez Opera House on Ferry Street near Escobar where the McMahon-Telfer Hall and several businesses stand now. "The Aged Equal Suffragist Speaks in the Opera House Saturday Evening" said the headline in the October 10 issue of the weekly Contra Costa Gazette. The adjective 'aged' was not an insult - at 76, she had already lived three decades or more than the average life expectancy of adults at the time. And she was keeping up a travel schedule that would be daunting to most of us even with today's convenient, quick conveyances, paved roads and plentiful clean and fully equipped rest stops. 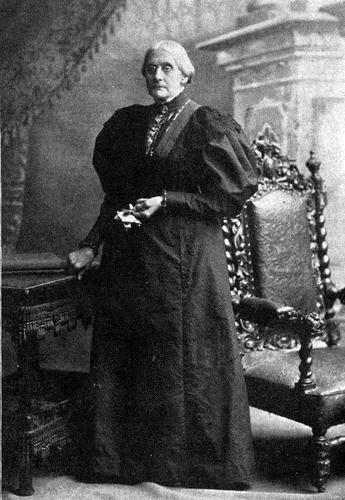 Describing Anthony's stay in California throughout the 1896 equal suffrage campaign, Ida Husted Harper wrote in her 1908 two-volume "The Life and Work of Susan B. Anthony". "Miss Anthony visited also various towns throughout the central part of the State and along the coast, speaking in wigwams, halls, churches, schoolhouses and the open air, taking trains at all hours, traveling through heat and dust, wind and cold; and there was never a word of complaint during all the long campaign. She was always ready to go, always on time, always full of cheer and hope." As Anthony stepped up to the podium following John Swett's "timely and well-worded" introductory speech, she immediately made a connection with the local audience by telling them how glad she was to speak in Martinez, a town which had been the home of one of the early leaders of what became the national equal suffrage movement - Mrs. Abigail Bush. Mrs. Bush was a New York native who was active in the woman's suffrage movement from right after its beginning at Seneca Falls, New York in 1848. Also an active abolitionist who helped with the Underground Railroad, Mrs. Bush moved to California and settled in Martinez in 1854 with her husband, Henry. Bush Street is named after them. (Mrs. Bush's story will be featured in 'Local History" next time). One of the most effective networkers in the 19th century if not ever, Anthony had been traveling all over the United States since the 1850s encouraging support for woman's suffrage, make friends and contacts among both men and women in the settled East Coast, the post-Civil War South and the frontier west. She was known affectionately as "Aunt Susan" by scores of local women she had encouraged to lead the suffrage movement in cities, towns and villages across the country. She returned the affection by keeping contact and friendship with all of her "nieces" as she called them which made them very proud. "Aunt Susan" was obviously warmer and more charismatic than she appears in the rather severe photographs that have survived her. Anthony had come to California a number of times including 1871 when adolescent Mary McHenry met her for the first time. Later, after McHenry became the first woman to graduate as a lawyer from Hastings College of the Law (1881) and became artist William Keith's second wife, she and Keith and their circle of friends including John Muir and John and Mary Louise Swett joined the Anthony network. Indeed, Anthony often stayed in the Keiths' Berkeley home on her trips to the Bay Area. Although well-known as an opponent of equal rights for women, John Muir took Anthony and the Keiths to Yosemite in 1895 where Anthony was as spellbound as anyone else by its beauty. Although some sources indicate Muir may have been more ambivalent on the suffrage issue than we've been led to believe, he never publicly supported it nor did he believe in equal educational opportunities for women much to his daughter Wanda's chagrin. But his best friend, Keith, did gradually change his own mind with his wife's relentless encouragement and his growing friendship for Anthony. He ended up donating several of his paintings to the National American Woman's Suffrage Association for fund-raising purposes and painted a portrait of Anthony which he completed after her death in 1906. His passing six months before the 1911 victory was mourned by the campaigning suffragists. It is thought that Mary Louise Swett, secretary of the Martinez Equal Suffrage Club which was running the local campaign, invited Miss Anthony to speak. No evidence has been found locally that she stayed at the Swett home following the speech but she may have as she was commonly invited to stay in the homes of local organizers. In the Gazette article announcing her impending visit, it was considered not necessary to announce the subject of her discourse because, the story continued, "She is the Mother of the Equal Suffrage Cause in America, and there is no doubt that the people of Martinez and vicinity are fully alive to the fact that a rare treat is in store for them in listening to her address." On November 3, 1896, amendment 6 was defeated by 26,734 votes statewide -- 110,355 for; 137,099 against. The no votes in the cities of San Francisco, Oakland and Alameda totaled 500 votes more than the entire statewide margin of defeat. No one had expected a win in San Francisco with its 25% of statewide registered voters and the active opposition of the Democratic Party, the labor unions and the liquor industry and all the campaign funding they could provide. But Alameda County was "a banner Republican county" and statewide the Republicans had pledged support. It was a blow that Berkeley was the only Alameda county city to vote in favor of suffrage. According to Harper's biography, Anthony donated her own services and her speaking fees of $25 totaling $3000 by November to the campaign plus paying her secretary's salary of $75 per month while allowing her to work fulltime on the campaign leaving Anthony to deal with her own immense correspondence. In return, Anthony "often said that the California campaign was the most harmonious and satisfactory of any in which she was ever engaged." That made the defeat more poignant for her the next morning when workers looked at her sympathetically. "She stood still in the center of the room for a moment" wrote Harper, "and then said sadly: 'I don't care for myself, I am used to defeat, but these dear California women who have worked so hard, how can they bear it?'" But the next day, 48 hours after the loss, California women convened their annual State Suffrage Convention, immediately raised the $1200 needed to settle all outstanding bills, elected a new president and made plans to start to work again using what they learned from this campaign to win the victory the next time. The following evening, according to Harper, "a grand rally was held in the Metropolitan Temple". Every seat was sold out and the aisle were crowded with people who appeared to feel they weren't part of a lost cause but had just suffered a temporary defeat. "Miss Anthony presided and was given a true California ovation and, as her voice rang out with all its old-time vigor, there was not one in that vast audience but hoped she might return to lead her hosts to victory." But it was not to be. Susan B. Anthony died in 1906 at the age of 86 after dedicating her life to a cause that would inevitably triumph, in 1911 in California and in 1920 nationally, in large part because of her.